Saturday, February 2, 2019 – 2:00 P.M.
Taken far too soon, Charles “Chuck” Kessler of Eubank, Kentucky passed away unexpectedly at the age of 64 on January 26, 2019 following a brief illness. He was born on January 23, 1955 in Philadelphia, Pennsylvania to the parents of Sam and Rosalyn Kessler. Chuck began his 37-year career with the Department of Defense at the Philadelphia Naval Shipyard in 1973 as a Sheet Metal Apprentice, learning the sheet metal trade from drafting to manufacturing and installation aboard naval vessels. In 1982 he was promoted to Sheet Metal Supervisor, a position he held until the closing of the Philadelphia Naval Shipyard in 1994. That same year, Chuck was transferred to the Great Lakes Naval Training Center in Great Lakes, Illinois. He was promoted in 2005 to Quality Assurance Specialist in the Public Works Department, a position he held until his retirement in 2010. Formerly from Kenosha, Wisconsin, Chuck had a passion for volunteering, as well as the Philadelphia Eagles. He was a member of the Kenosha County Sheriff’s Department Citizen’s Academy from 2005 to 2013. Chuck assisted with numerous public events such as the Kenosha Business Expo, the Kenosha County Fair, the Kenosha Civic Parade, and the Drug Awareness Resistance Education (DARE) program. Chuck also assisted with the Retired Senior Volunteer Program (RSVP) from 2011 to 2013. In 2013 Chuck moved to Olivet, Michigan. He joined the Olivet Lion’s Club and was a member of the Charlotte Frontier Days Board of Directors, where he served as the Parade Chairman in 2016. Chuck also enjoyed assisting with the Eaton Special Riding Volunteer Association in Charlotte, where horses are introduced to children with special needs. In 2014 Chuck was hired by Walmart in Charlotte. On June 22, 2015 Chuck and Sue Rigas were married. Both Chuck and Sue were baptized on July 23, 2016. 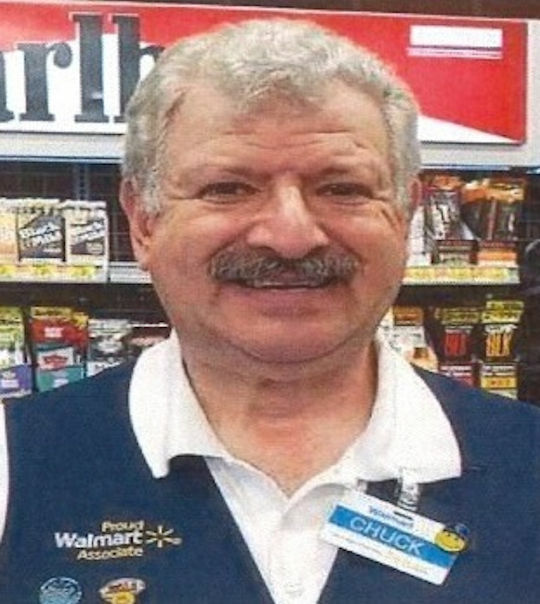 They moved to Eubank, Kentucky in October 2016, where Chuck continued his employment with Walmart at the Somerset, Kentucky store. Chuck was a member of the Somerset Lions Club. Chuck leaves behind his wife, Sue, his children Eric, Julie, and Joey Kessler, former spouse Susan Kessler, his sisters Naomi Bailey and Faye Schmidt, brothers Edward and Michael Kessler, nieces Laura Ann, Rebecca, and Renee, and nephews Max and John, as well as hundreds of friends. In lieu of flowers the family has requested that contributions be made to Somerset-Pulaski County Humane Society, P.O. Box 448, Somerset, KY 42502. A Celebration of Life service will be held at 2 p.m. Saturday, February 2, 2019 at Southern Oaks Funeral Home, 2110 W Hwy 914, Somerset, KY.